Hello and welcome to the October 2009 Immigration Newsletter! Fall has set in, the leaves are changing color here, and we have several things to talk about in immigration. The first week of October marked the beginning of the DV-2011 lottery program. This is the time many people wait for all year long. However, unlike previous years, the 2011 DV Lottery came in with so little fanfare that unless you were paying close attention you would have missed the announcement. While the start of the DV program this year received very little attention it is still a very important program for many people. For those wanting to apply the list of eligible countries remains same as that for DV-2010. One of the major, and most dramatic changes for the month is the USCIS website. The USCIS recently launched its redesigned website, now in both English and Spanish. The move came after it had received many complaints that the previous website was “frustrating” and “hard to navigate.” The new website now looks more appealing and user-friendly and is more customer-centric. Darrell West, Vice President and Director of Governance Studies at the Brookings Institution, said the redesigned USCIS website appears to be more user-friendly than the old Web portal and more logically organized. “One of the best features is the ability to personalize the site to your particular situation,” West said. A simple example of the new user-friendly features is that the new USCIS website allows applicants who have filed for citizenship to track the progress of their cases. Jeffrey Zients, the Obama administration’s chief performance officer, said the new website was a “significant step” for the public and USCIS’s customers. “It’s also a significant step for our federal government in terms of providing services that [are] smarter, faster and lower cost,” Zients said at a press conference where officials unveiled the redesigned website last week. 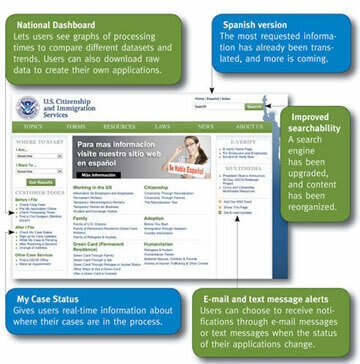 USCIS processes requests about immigration-related applications and petitions, and the agency’s existing Web site was one of the most-used government sites with about 230,000 users per day. However, USCIS said users of the old site found it difficult to use. The new website allows users to choose to receive notifications by e-mail or text message when the status of an application changes, and the site also provides access to national trend data and raw data that can be used in additional applications. And for the first time, the redesigned USCIS.gov has a version in Spanish. Following in the foot-steps of USCIS, the US Department of State has also revamped its website. 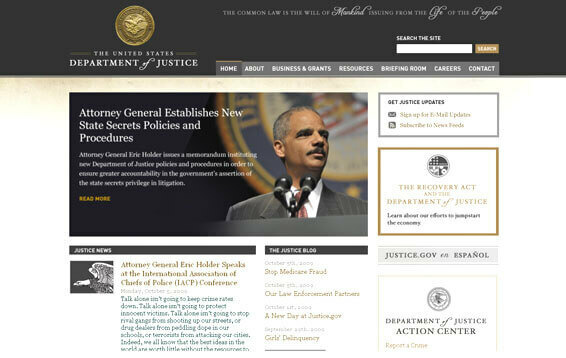 The Department of Justice (DOJ) unveiled its revamped website on October 1, 2009. The website was redesigned in an effort to increase “openness and transparency in government.” Utilizing a variety of online tools, they will be able to share news and information, not just on the DOJ web site, but through popular social networks Twitter, YouTube, MySpace and Facebook. The Justice Department’s presence on these social networks will allow Americans to interact with the Department in entirely new ways. The new website has incorporated more multimedia than ever before. We’re told that there is a new photo gallery and video library that will be regularly updated with new content from across the Department of Justice. And of course, “The Justice Blog” will be a hub of information for the Department. USCIS has not only revamped its website, it has also revamped its some of its methods and procedures. More US employers are reporting random, unannounced visits by the Fraud Detection and National Security Division (FDNS) of USCIS. FDNS inspectors often use a set script of questions and ask to speak with an employer representative and any foreign workers at the work site.FDNS uses what it learns from these visits to add fraud indicators to its database in an effort to identify patterns and potential fraud during adjudications. Employers can prepare for such visits by conducting a self-audit of their I-9s and H-1B Public Access files, and by ensuring strong compliance policies are in effect. We recommend designating an “immigration compliance officer,” who should contact counsel immediately in case of an FDNS site visit. We also recommend preparing a response plan in advance that includes everyone from upper management to receptionists. Finally, the Department of Labor (DOL) has issued a frequently asked questions (FAQ) sheet about the new iCERT Portal and the newly redesigned ETA Forms 9035 and 9035E. Topics discussed include how to correct an invalid federal employer identification number after a denial on that basis; filing on behalf of a new company created through a merger, acquisition or sale; the required contact information to enter for employer point of contact; how to enter a prevailing wage survey on the new LCA; and how to withdraw an LCA after certification. USCIS on October 7, 2009 issued guidance to clarify for performing arts associations and their members the regulatory requirements for agents who file as petitioners for the O and P visa classification. USCIS on October 6, 2009, announced a new address for prospective adoptive parents to submit Form I-800 and Form I-800A. The change is effective October 6, 2009 and the applicants have a 30-day transition period before USCIS will return incorrectly filed petitions. USCIS on October 6, 2009, announced a new address for prospective adoptive parents to submit Form I-600 and Form I-600A. While the change took effect on October 6, 2009, applicants have a 30-day transition period before USCIS will return incorrectly filed petitions. Now for the regulars – this month’s Immigration Article entitled ‘MAVNI Program: Direct US Citizenship without Permanent Resident Status’ explores how the one-year MAVNI Program gives a direct route to U.S Citizenship regardless of the permanent resident status of the foreign national. Also check out our In Focus section for this month, which explains how a J-1 Umbrella Sponsor can help you obtain a J-1 Visa. We congratulate Maria Silva for winning last month’s Immigration Quiz. Again, we received a significant number of responses from our readers, who talked about various solutions to support their position, but Maria Silva gave the correct answer and won free online consultation to discuss the concerned Immigration issues. So it’s time to get ready for this month’s quiz. If you know the correct answer your name might be featured in next month’s newsletter. All the Best!!! The Department of State has released the Visa Bulletin for November 2009 containing immigrant visa projections for the coming month. The priority dates for employment-based permanent residence categories have enhanced slightly in November. The Department of State (DOS) on October 6, 2009 published a final rule for religious workers, which established the requirement that consular officers should ensure that R-1 visa applicants have obtained an approved USCIS Form I-129 petition from DHS before issuance of a visa. The R-1 final rule is effective from October 6, 2009. USCIS on October 2, 2009 announced that it has issued a Revised Entry of Appearance as an Attorney, Form G-28. USCIS will accept old versions of the Form G-28 until October 30, 2009, after which, old versions will be considered invalid. Did You Know About the J-1 Umbrella Sponsor and its Advantages in Obtaining a J-1 Visa? US immigration law has provisions for several categories of “J-1 Exchange Visitors”, which include Au Pairs, camp counselors, summer work/travel, physicians, professors and researchers, short-term scholars, teachers, students, and trainees. To obtain a J-1 visa, you need to have an employer and the employer must be pre-authorized by the State Department to sponsor a J-1. But not all the employers are pre-authorized to have their own J-1 program. Thus, the J-1 umbrella program comes to rescue in such situation. In this article we will focus on the trainee program and discuss what a J-1 umbrella sponsor is. We will also talk about the use of an umbrella sponsor to obtain a J-1 visa. The Military Accessions Vital to the National Interest (MAVNI) program is a program which authorizes certain branches of the military to recruit certain legal aliens whose skills are considered to be vital to the national interest. The one-year MAVNI pilot program allows the military to recruit up to 1,000 non-citizens who do not have permanent resident status, but who have been in US legally for at least two years. The MAVNI Program allows foreign nationals that join the military to apply for U.S Citizenship through naturalization without first having to obtain permanent resident status. In this article, we will explore how the one-year MAVNI Program gives a direct route to U.S Citizenship regardless of the permanent resident status of the foreign national. My husband withdrew his support for the joint petition [to remove conditions on permanent residence] on May 29, 2009, and I got a notice of withdrawal for me and my daughter on September 13, 2009, but the notice itself is dated August 27, 2009. Can I re-file the Form I-751 based on the fact that marriage entered into in good faith but which have been terminated? I have some documents: rental agreement, shared account, the police report etc. Since the previously filed petition was withdrawn you can file a new Form I-751. If the divorce is final you may file the new I-751 based on the fact that the marriage was entered into in good faith and has been terminated. If the divorce is not final yet you will have to wait for it to be finalized or you will have to file under the abused spouse provision. If you file under the abused spouse provisions you will have to meet a much higher standard of proof than the standard set for simple terminated marriage cases. You have to submit copies of the documents you listed above in support of the petition (including the police report) to prove the validity of the marriage. If you file to remove the conditions based on the termination of the marriage you will most likely have to attend an interview at the local USCIS district office. If you file based on the abused spouse provisions the USCIS policy is that you will have to attend an interview. At that time you can take the documentation that you have, as well as any other documentation that you can gather, including statements from friends (both yours and his if possible) that state how they know you, and that you and your ex-husband were living together with your daughter as a family. It is especially helpful if you can get a statement from any of your ex-husband’s family. You should also include a detailed statement about your relationship with your ex-husband — how you met, how long you knew each other, what your marriage was like, and what went wrong at the end. I currently posses an H-1B with company A. This H-1B expires in Feb 2010, however, I have accepted a job offer to work for company “B”. The company B filed an H-1B for me on April 6th and has the FedEx confirmation number. Can I can give two week’s notice at company A and start employment for company B at any time or do I have to wait for USCIS to issue a case number. What could go wrong? In an H-1B change of employer case from company A to company B, you are authorized to start work for company B upon filing of the H-1B petition by company B. The regulations provide that a petition is regarded as properly filed when it is stamped by the USCIS to show the time and date of actual receipt, it is properly signed and the correct filing fee is attached. A FedEx confirmation merely proves that a shipment was delivered and does not prove any of the elements of a proper filing. Premature reliance on a FedEx delivery confirmation to start work for company B and a subsequent rejection of the filing could result in unauthorized employment and consequent ineligibility for portability upon the refilling of the H-1B petition by company B. After confirmation of delivery by FedEx the petition could be rejected for filing by USCIS for any number of reasons, including because it was not properly signed or because the proper filing fee was not attached.